Barcelona’s most inviting and cosy cafés are just the place for that warm pick-me-up only a perfectly brewed cup of coffee or a nice cup of tea can give. The city boasts countless number of charming cafés, perfect spots to take a break, have a chat, scrutinize a blind date, or just take a book and relax with a coffee or tea. It seems you can’t get through a week in the city without a new café or tea room opening up and drawing you in. 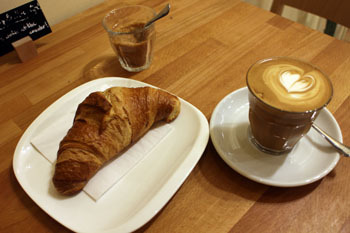 The list is never-ending, so let us guide you to some of the top coffee places in Barcelona. In the Cafés El Magnífico shop – where you can get yourself some of the best coffee beans in the world – there’s also an area where you can have an excellent cup of coffee. It’s not cheap, but the high quality of the coffee is worth the extra coins once in awhile. The smell and the taste of the coffee are really something special; and the café’s location in El Born means you’ll have lots of great streets to walk around after your coffee. Caelum is an incredibly welcoming coffee shop with a nice medieval feeling and delicious baked goods. Most of the products have been made in monasteries and convents throughout Spain. There is a wide selection of tea and coffee, artisan cakes and biscuits, jams, liquors, etc. Caelum functions as a shop as well, where you can buy specialties like handmade candles, olive oil, honey, wine and other sweets. Salambó is the perfect place to have a coffee or a glass of something else that is very popular here: the cocktails. Salambó is in the Grécia district of the city and it is a popular destination for pre and post-film drinks since it is situated next to the Verdi Park Cinema. It is a cool place with a communal feel in the young and fashionable neighborhood of Barcelona.